• Reduce prescription opioid painkiller abuse. • Improve opioid painkiller prescribing practices and identify high-risk individuals early. • Ensure access to Medication-Assisted Treatment (MAT). • Treat people addicted to heroin or prescription opioid painkillers with MAT which combines the use of medications (methadone, buprenorphine, or naltrexone) with counseling and behavioral therapies. 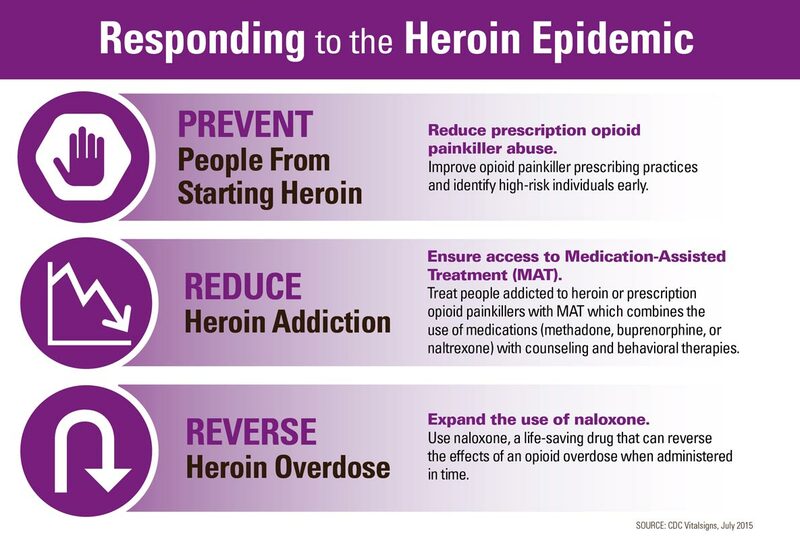 • Expand the use of naloxone. • Use naloxone, a life-saving drug that can reverse the effects of an opioid overdose when administered in time. MMWR Morb Mortal Wkly Rep. 67(33):925-930.